In a seedy internet café in a backstreet of Helsinki six men and women sit, bent over their keyboards, working. They don’t look particularly evil. You wouldn’t pull your children closer if you saw these people on the subway. But tonight, they are the biggest evils on the Internet. They are black hat hackers, computer security experts that break into systems for profit. And tonight, they are having a contest who can steal some critical data from a well-protected server first. The bad kind of hacker, or more correctly cracker, are really called black hats, by the way, alluding to the black hat wearing bad guys in western movies. So that’s your role in Black Hat, a game that mixes trick taking with strategic movement on a board, so it’s in part a card game. Cards are defined by two numbers: their rank and their point value. There are no suits – because real hackers don’t wear suits, right? Your goal is to score as few points as possible, because points are big and flashy and you don’t want to be noticed. There are two ways to score points: from your board position at the end of a round and from leftover cards on your hand. A round is played as a series of tricks and ends when one player runs out of cards. In Black Hat that doesn’t happen at the same time for all players, because not everyone plays the same number of cards in a trick. Then you add points from your remaining cards to the points of the servers you are on on the board and advance on the score board. The player starting a trick plays any number of cards of the same rank. The other players then follow with the same number of cards. Singles go on singles, pairs go on pairs and so on. If a player can’t or won’t play a matching set he discards a single card instead, but then he can’t win the trick. He’ll also have more cards left in his hand which is generally not a good thing. That goes to the highest rank set played, in case of the draw to the player further from the start player. 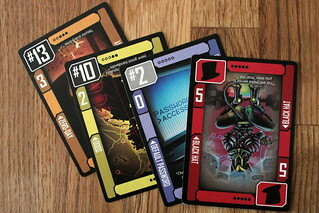 Except when the Black Hat card is in the trick, a very special kind of wild card. Played on its own it’s worth 14 points, one more than the highest regular card, played in a set it takes the value of the other cards. If a trick contains the Black Hat, it goes to the lowest rank in the trick. That’s not all, though, the winner of the trick has to take the Black Hat to his hand, plus as many cards as the trick was started with. The winner in a Black Hat trick always ends up with more cards than he started with. And if that still isn’t bad enough, it’s also worth 5 points, more than any other card. The Black Hat is the gift that keeps on giving, and not ending the round with it is a major part in Black Hat strategy. Winning a trick is not worth any points, neither positive nor negative, but only the winner gets to move on the board. For every trick you win, you move one of your two top hats – yes, your pawns are wooden top hats – along an arrow from one server to the next. Movement on the board never goes downwards, but you do sometimes decide which way you follow to try and position yourself on lower value servers. If the next server is already taken by another hat, you may jump over it to the next server. If that is also taken to the next, and so on. Because of this, playing Black Hat is a lot more fun in five or six players. With too few players, the game drags a bit because you move step by step. With more players, you can often skip more than one server and make everyone move upwards more quickly. There’s also an additional layer of strategy in moving at the right time, when you have a chain of hats ahead of you, and in breaking up such a chain before an opponent can use it. In general, when you move is much more important than where you move. You want to move when you can skip some servers, you don’t want to move into a high value server if you don’t think you can get out before the round ends and so on. Timing is everything. Where you move is not completely without relevance, though. The servers have different point values, and a few of them have special abilities to take into account. The most prominent on the base board is the Honeypot. The first player moving into it gets stuck there, but everyone has to cross it to get to the finish. Players tend to line up in front of it and hope not to get that critical trick that will make them move in. Or they just hop in and get stuck, because the Honeypot also has a value of zero, not a bad place to spend eternity. The other special is the FBI Server. It lets a player moving into it return another hat to the start, but he also gets stuck in the server. You can have more special servers with the additional board elements that cover up parts of the basic board. They make the game more interactive in some ways, but I prefer the game without them. With two many specials on the board, you can get odd situations like players joyously jumping into two Honeypots. That makes sure they’ll never score points for their servers, but it takes them out of the race for the top. A practical strategy, but I didn’t find it very satisfying to skip one part of the game. Over the years, there have been many games trying to spice up the old trick-taking mechanic. Black Hat is one of the good ones, in my opinion. The trick-taking part is quite plain, but the Black Hat card as some twists to it, and the movement on the board makes when you take a trick just as important as the number of tricks you take. 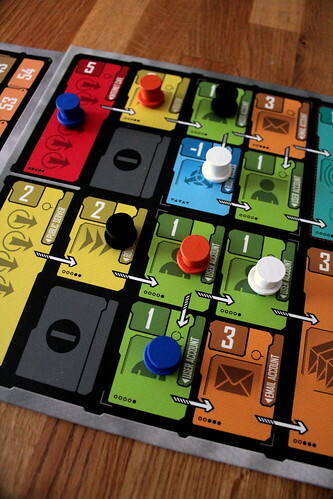 That brings some strategy to the game and you’ll have to make interesting decisions to win. It’s not without some caveats, however. It definitely works better in more players. I can’t recommend it in two or three players. It works in four, but it’s really good in five or six because movement on the board is quicker and timing is more important. Also, the additional specials you can add to the game will not be everyone’s cup of tea. I prefer to keep it simple and play on the basic board, but either way Black Hat is a fresh breeze in the trick-taking genre.